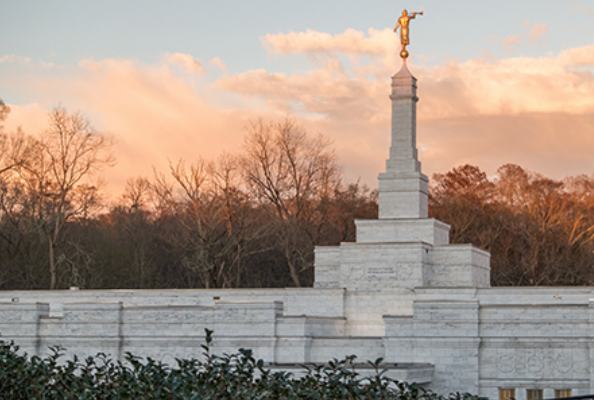 The Baton Rouge Louisiana Temple has seen a lot since its dedication 18 years ago. The announcement of the temple at the October 1998 general conference came just months after President Hinckley’s announcement to build smaller temples. It was one of the initial 30 announced and was an answer to members’ prayers in an area where Church history dates back to 1841. At the time, two members mailed $10 to Joseph Smith, telling him there was a small branch in the area and requested that an elder be sent. “When confronted with the snares and entanglements of this life, we are grateful for this temple as a place of refuge, of safety, of serenity, and peace,” he said. That sentiment would become quite literal when, just five years later, the area was hit by Hurricane Katrina. The category five hurricane had a final death toll of 1,836 and left major parts of Louisiana and Mississippi devastated.